NEW YORK--(BUSINESS WIRE)-- As more people are living into their 80s and 90s, more than one out of every two Americans has their sights set on even greater longevity. 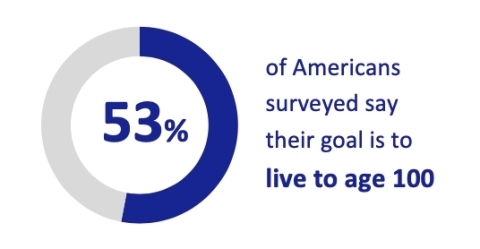 According to a survey1 released today by AIG Life & Retirement, a surprising 53 percent say their goal is to live to 100 years. Thirty-nine percent identify deeper family relationships as the main benefit of such a long life, 32 percent name seeing the world change and 17 percent want to remain productive. When asked to pinpoint their greatest concern about living to 100, the potential for serious health conditions (35 percent) topped the list, followed by burdening their family (27 percent) and running out of the money needed to live comfortably in retirement (25 percent). When considering financial concerns, generating lasting retirement income (23 percent) and the rising cost of healthcare (23 percent) tied as the most significant financial challenge Americans said they would face when planning for retirement. These challenges were followed by concerns about Social Security and Medicare (19 percent) and stock market volatility (19 percent). Furthermore, with recent market volatility and December’s nearly ten percent stock market drop still fresh in consumers’ minds, 86 percent of Americans confess to anxiety about funding their retirement lifestyle through their retirement account investments, which typically include stock market exposure, as opposed to a guaranteed source of income. While financing a long life is a concern for all, the burden weighs more heavily on the shoulders of female respondents—especially since they have longer projected life expectancies than men. Women are significantly more anxious than men about funding their retirement lifestyle through their retirement account investments versus a guaranteed source of income (60 percent of women are somewhat or very anxious, compared to 47 percent of men). Results show that even a little more certainty can go a long way; six in 10 (60 percent) said $10,000 more per year of guaranteed retirement income would help ease their minds. Additionally, 75 percent of survey respondents said guaranteed income every year for life would give them greater levels of happiness and satisfaction in retirement. Certainty seems to have an even greater impact on female respondents; women were more likely than men to say they believe they would derive happiness from guaranteed income (women averaged 4.21 on a 5-point scale vs. men at 3.98). Working with a financial professional also boosts confidence for a potentially long retirement. 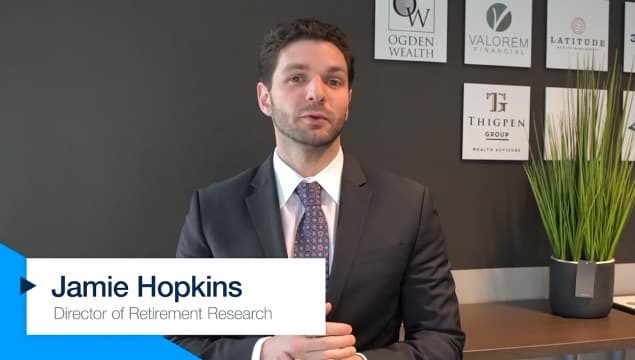 When asked whether they believe their current retirement savings plan will sustain them financially until the age of 100, respondents with advisors are significantly more confident than those going it alone. Nearly half (45 percent) of those with advisors are very or extremely confident, compared to only 8 percent of do-it-yourselfers. In fact, working with an advisor allays financial fears about growing older; nearly two-thirds (64 percent) of respondents with an advisor say they want to live to 100, compared to only 37 percent of those without an advisor. Respondents are also thinking about how they can ensure the financial security of their loved ones in the case where their life expectancy differs from their spouse; only 16 percent of respondents say they are extremely confident that their partner would be able to manage his or her spending from retirement savings if they were to die first.